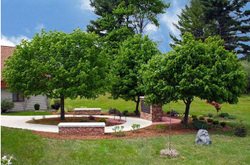 Columbarium - Christ the King Lutheran Church -​ Gladwin, Mi. A niche or niches may be purchased in the Garden. A niche may be paid for in full at time of purchase, or an "options Payment Plan" discussed. Niches have been reserved and additional one are available for purchase. Memorial plaques are also available in memory of a loved one buried elsewhere . Individual wall plaques are $400.00 and cab be inscribed with one name and date.